When Gregory Paul moved to Seattle from upstate New York, he wasn't sure what the future might hold. In the two years since he's been here, he's had success, collaborating with Sera Cahoone and playing tours along the west coast. But, as is the case for many musicians, tours and big shows are only a small part of the calendar year. 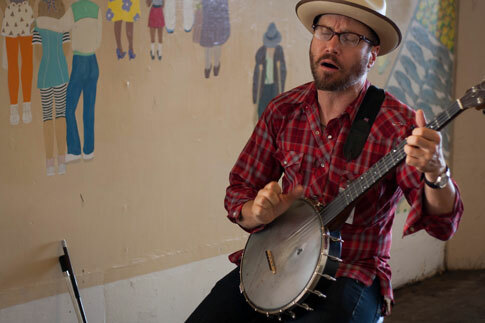 In the spaces between, Paul continues to return to the market, adapting 19th century American folk songs like “Wayfaring Stranger” to fit his distinctive style. SM: How is your version of “Wayfaring Stranger” different? GP: Sometimes I use a bow on the banjo for the beginning of the song. It's a technique I pulled over from my experience on guitar. “Wayfaring Stranger” is one of those traditional songs that’s been around for a long time. Nobody really knows how far back it goes. But I put my own twist on it. Some people are very purist about old time music, but I try to adapt it. I like to do things in my own way while keeping some of the same melodies. SM: You're playing at one of the market's stairwell locations, which has great acoustic qualities. Do you usually try and play here? GP: This is the best sounding place to play in the market, but I don't play here very much. I play mostly outside the original Starbucks, because there is always a line of people out the door. Playing there in the morning seems to work really well for me. SM: Is the original Starbucks a hard spot to sign up for? SM: Were you a competent street performer from the beginning? GP: No, it took a long time. When I first came down, I had no idea what I was doing. There's definitely a method to the madness. If you just show up and pick a spot and throw down your hat, you aren't going to be successful. I realized that people love the old time music and the banjo. If I came down with a guitar and sang my own songs, I wouldn't make any money. You have to stand out. Sometimes I'll wear old-timey clothes to go along with the music. People like that gimmicky stuff. The people watching you are tourists, and this is our Disneyland, so you've gotta be Donald Duck or Mickey Mouse. But in the end, as long as you're good at what you do, you'll do well. Listen to this live performance of "Wayfaring Stranger," adapted by Paul for his most recent album, Little Black Train. Recording taken at Pike Place Market on September 11, 2011.